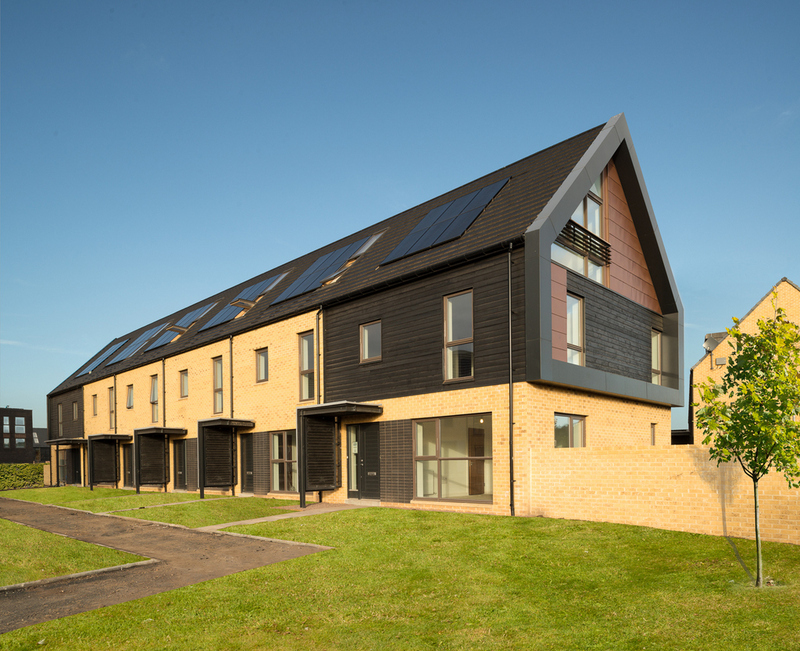 Pictured below is one of the 700 EcoHome Excellent properties that form the £200m Athletes’ Village project in the East End of the city. Only properties that produce 60 percent fewer carbon emissions than traditionally-built structures are awarded an ‘excellent’ rating. The building envelope is an important part of achieving this because high levels of air tightness at critical areas such as roof eaves and ridge can significantly affect the overall energy efficiency of the building. It is essential on all low carbon builds that client’s commission the services of building envelope specialists such as Marley Contract Services who can work with them to ensure the completed properties meet the thermal performances laid down at design stage. The Athletes’ Village is being built by the City Legacy consortium, which is made up of developers and contractors CCG, Cruden, Mactaggart & Mickel and W H Malcolm. Each of whom have an unparalleled local track record of residential development and job creation. In the short term, the Athletes’ Village will provide beds for 6,500 athletes and officials during the Glasgow 2014 Commonwealth Games. After the Games, it will transform into a lively residential community with housing, amenities and public spaces, some on a riverside setting and offering a wonderful environment for a new family focused community. The development covers a 38-hectare site and when completed in December 2013 will include 700 low carbon riverside homes and related accommodation as wells as a 120-bed care home for the elderly. 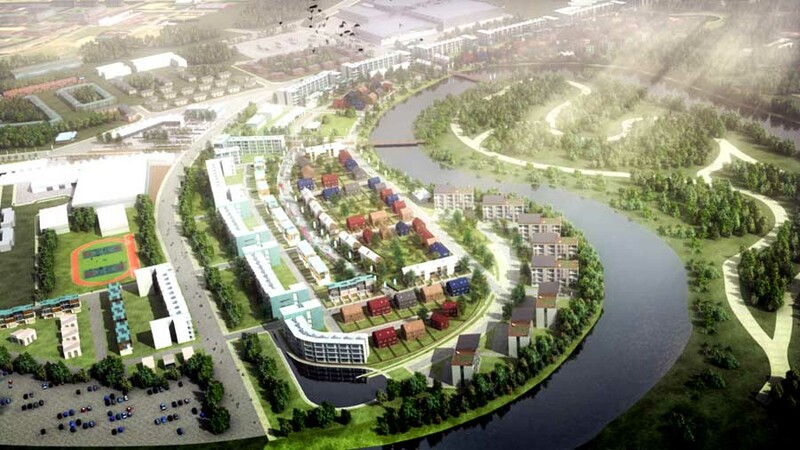 Glasgow City Council will this week consider – at its Executive Committee on Friday 26 June – a report recommending the preferred development partner, the City Legacy consortium, to deliver the Glasgow 2014 Commonwealth Games Athletes Village. The successful development of the 38.5 hectares site in Dalmarnock, in the heart of the Clyde Gateway project, is a key component in the delivery of the Games. The Village will provide accommodation and facilities for 6,500 competitors and officials. After the Games, the Village will become a desirable new residential community including private housing, 300 homes for rent and a new 120 bed care home for the elderly. 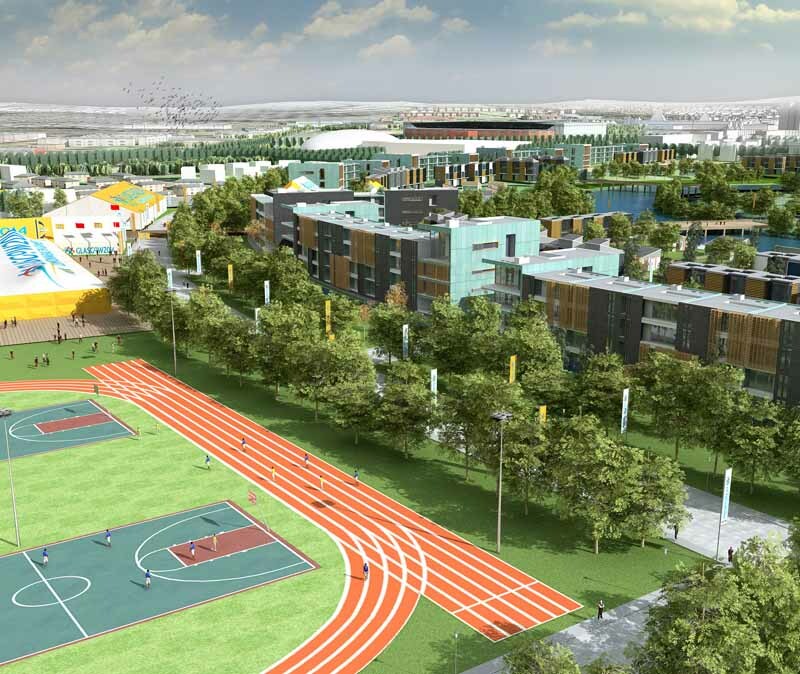 The removal of the temporary facilities within the Athletes’ Village after the Games will release additional land for further residential development. The proposal for the Village has high design and environmental standards and will deliver a highly desirable new residential neighbourhood within Glasgow’s East End. 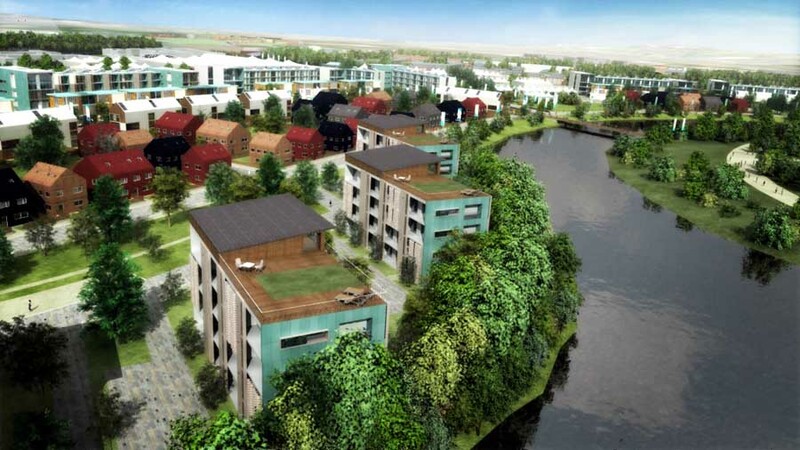 The masterplan submitted by City Legacy will deliver a 95% reduction in carbon emissions from the new homes to be constructed – a first in Scotland for a development of this scale, of over 1400 homes and the care home. Through the development of the Village, the successful development partner will be expected to bring community benefits to the city by generating employment and training opportunities and creating opportunities for small to medium sized enterprises and social enterprises. One example of this is the number of new jobs – 93 – that will be created as part of an overall direct workforce of 620. 60 of these will be apprentices. The partnering agreements with sub-contractors and suppliers will see 36 new jobs being created there, 24 of which will be apprentices. The indirect workforce will be around 200. After inviting interested parties to submit initial masterplans illustrating how they would develop the site, the three consortia on the final shortlist were considered by Glasgow City Council in the final months of the project, before the final scoring process and selection was made. Throughout the entire process, the businesses involved had to show that they had the appropriate resources, knowledge, skills and experience to deliver the master planning, funding, construction and re-use of the Athletes’ Village. The key criteria of the scoring process included project design, project delivery, infrastructure impact, community benefits and contractual, financial and legal details. While Glasgow City Council shall make the Village site available at nil cost initially in order to reduce borrowing requirements, the appointed development partner will enter into a profit sharing arrangement with the Council at the end of the project. Images, including video of how the site appears now and what it will look like during the 2014 Commonwealth Games and after, are available on request. The announcement today that Glasgow has won the bid to host the 2014 Commonwealth Games signals a significant step in the regeneration of Glasgow and its standing in the global arena. The announcement took place today in Sri Lanka with 47 of the 71 voting nations opting for Glasgow, to 24 for the Nigerian capital Abuja. 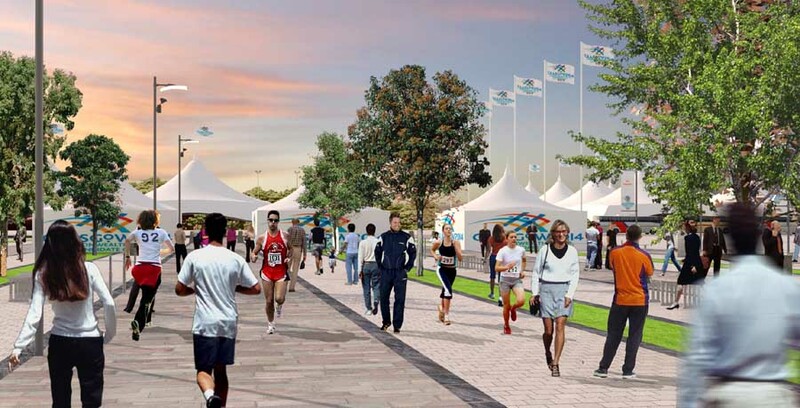 RMJM’s team in Glasgow has been working with Glasgow City Council on the bid for 2 years, to create the masterplan for the 2014 Commonwealth Games Athletes Village. The masterplan site covers approximately 40 hectares and is located in Dalmarnock in the East End of the City. The scheme aims to tackle the regeneration of one of the City’s most deprived and socially problematic areas, to create a successful and exciting Games Village accommodating over 7,000 athletes in more than 1,000 new permanent housing units. Facilities such as landscaped areas, an international zone, a transport hub and a hotel also form part of the Village masterplan. 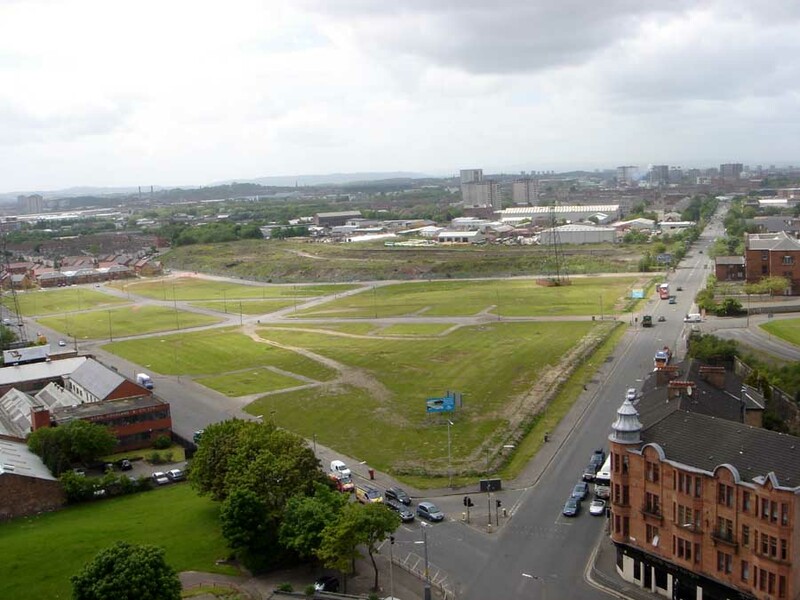 With the successful host city for the 2014 Commonwealth Games to be announced on 7th November, Glasgow’s visionary bid promotes the regeneration and re-use of a brownfield site to create an ambitious new East End neighbourhood. 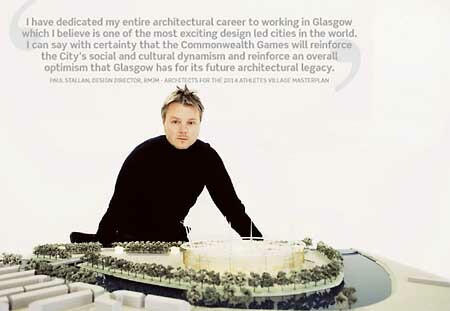 RMJM was approached by Glasgow City Council in December 2005 to create the masterplan for the 2014 Commonwealth Games Athletes Village. The final bid submission for Glasgow was in May 2007, and following a visit from the Commonwealth bid committee in August, the successful host city is to be announced next month. Glasgow is up against the Nigerian capital Abuja, and Nova Scotia’s Halifax. Glasgow is mid-way through one of the largest inner city regeneration programmes in Europe, the Clyde Gateway Project, which centres around the Games Village. At the heart of the design solution is the Village legacy which considers how the site will develop after the Games are finished to provide a sustainable urban living environment. Additional units, community buildings, transport connections, local facilities and amenities and good quality pedestrian flow will all be integrated into the solution. – A secure residential zone with a number of permanent dwellings that meet sustainability objectives. – An international zone with a range of temporary buildings that include a shopping complex, entertainment complex, conference rooms, media facilities and a security management centre. – Extensive Village support services which are required by athletes/team officials, including restaurants, team offices, service and travel centres, and of course gym and fitness facilities. The design concept maximises the proximity to the River Clyde and provides a high proportion of green space, amenity land and water features within the site. It will be divided into 6-8 themed areas based on Scottish glens, clearly signposted and colour coded to aid orientation through the site. 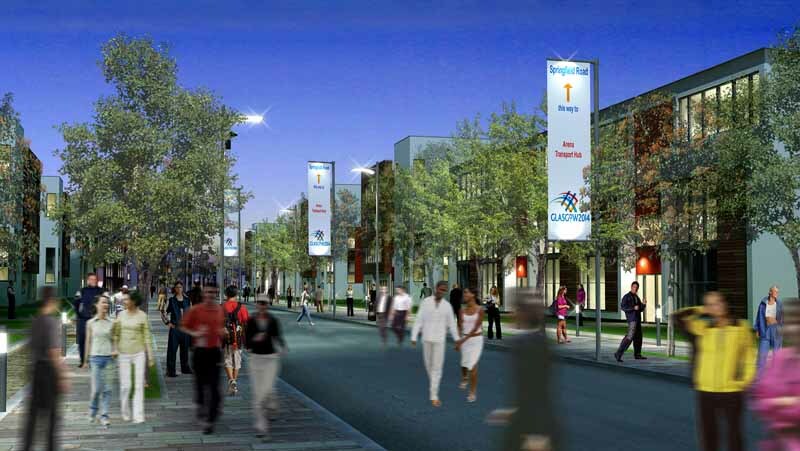 The village will be car free with a looped bus service around the Village using electric vehicles and will also have its own extensive transport mall providing regular and frequent bus access to all of the Games venues. The Village masterplan incorporates a variety of house types and sizes. They will include 4, 3 and 2 story dwellings, with a mix of apartments, townhouses, detached and semi detached houses. This range of housing types will give maximum flexibility for the Games and be an attractive mix for onward sale and rent after the Games. Ultimately, the masterplan proposes a new inner city housing neighbourhood for Glasgow, maximising the re-use of brownfield land for residential development and amenity use. 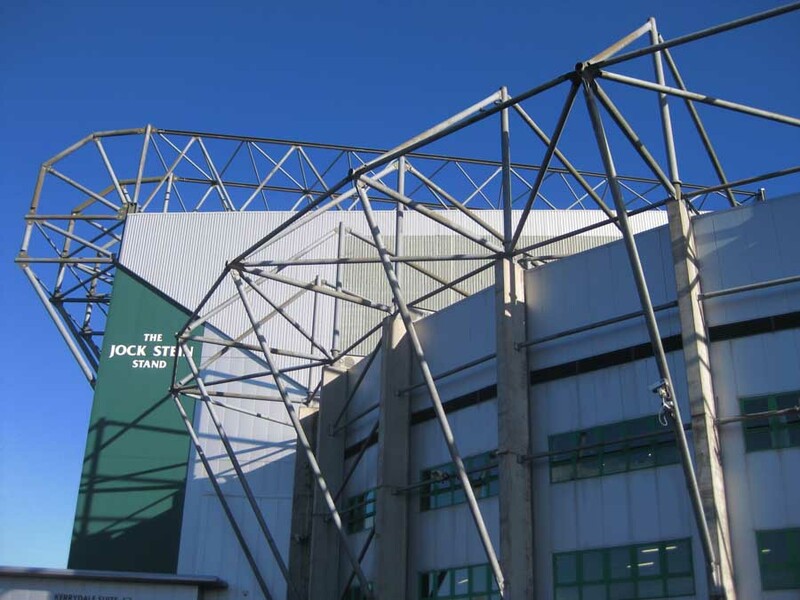 Post Games, it will provide a mix of private housing for sale or rent, and social housing to meet the needs of the community in the East End of Glasgow. It is the largest and most ambitious of the new housing neighbourhood projects being developed in Glasgow. RMJM has experience in a number of Games initiatives. The RMJM designed Olympic Green Convention Centre for the Beijing 2008 Games is nearing completion on Olympic Boulevard, while the company is currently bidding for venues as part of the London 2012 Games, including Eton Manor. Further afield the practice is currently working on a variety of projects in Kazakhstan, in support of their Winter Olympics bid.